Here’s a quick and easy project that only looks complicated! The hexagons are prepared using precut iron-on interfacing and stitched together by machine. Each hexie flower is then appliquéd onto the background fabric. 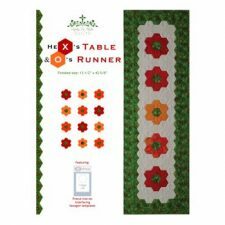 To complete the illusion that the entire table runner is constructed with hexagons, half-hexies are appliquéd around the edges using the border fabric and the background and borders are quilted with hexagons. 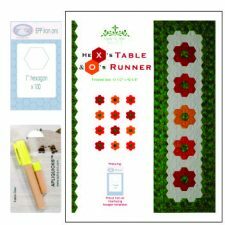 The table runner pattern, precut iron-on interfacing and glue can be purchased separately. Or you can purchase a table runner pattern combo, which includes the precut iron-on interfacing and glue, and save $5.